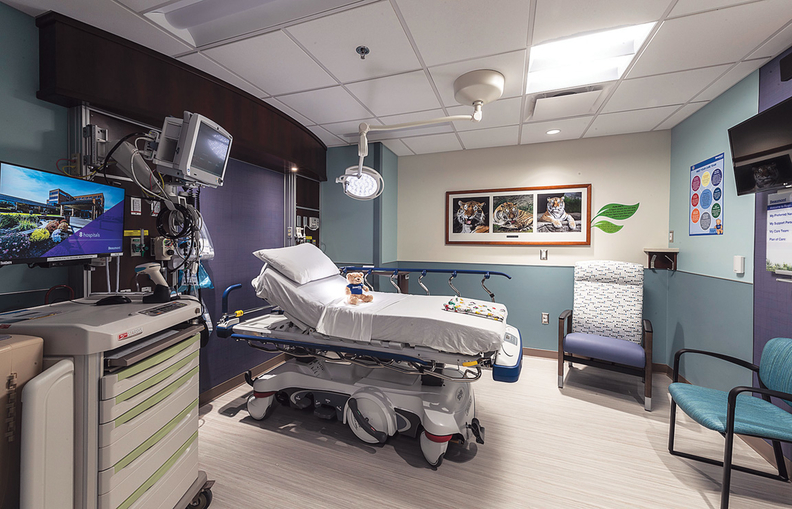 The 9,500-square-foot pediatric emergency center at Beaumont Hospital Royal Oak features 16 private rooms, twice the size of those in the former area. The larger rooms will be more comfortable and efficient for families and include decorative touches to help soothe young patients. A middle-school student in Ohio was worried about her friend's mental health, so she told her teacher. The school is part of Columbus-based Nationwide Children's Hospital suicide prevention screening network, where Nationwide clinicians provide on-site mental health screening, trained teachers lead discussions on the topic, and students fill out questionnaires and can suggest friends who they believe need assistance. The school and Nationwide facilitated an emergency assessment for the girl, which revealed that she felt guilty she couldn't have done more for a different friend who committed suicide the prior year. The focus on behavioral health is surfacing in pediatric facility design. As this traditionally underserved area of healthcare grows, providers are boosting their mental health services by hiring more specialists, building more private rooms, integrating more play areas, and weaving more soothing, nature-related elements into the design. “We realized we needed to think about children's health differently,” said Patty McClimon, Nationwide's senior vice president of strategic and facilities planning. Nationwide already has one of the largest behavioral-health programs in the U.S., logging nearly 209,000 visits for more than 33,100 patients last year, but it doesn't have adequate acute-based services. Pediatric patients often showed up in the costly and ill-equipped emergency department because they had no other place to go. So Nationwide started planning its $158 million, nine-story free-standing psychiatric facility in 2014. The 386,000-square-foot Big Lots Behavioral Health Pavilion will include 18 acute-care beds, conference space that could be used for mental health specialist training, a gym, a rooftop play area and outdoor courtyards. The building is expected to open in 2020. Mental health is a silent killer. It's hard to come to terms with, particularly among children and adolescents. About 75% of mental illness manifests before the age of 24, and left unaddressed, can have a significant downstream effect on the healthcare system and society at large. About half of adolescents ages 13 to 18 live with a mental disorder, but more than half of those go untreated, according to the National Institute of Mental Health. About 1 in 5 adolescents experience a severe mental disorder compared with about 1 in 8 children ages 8 to 15, according to the National Alliance on Mental Illness, a patient advocacy association. Suicide is the third-leading cause of death in youths ages 10 to 14 and the second for those ages 15 to 24. About 2 in 5 students with a mental health condition age 14 and older drop out of school. Nearly three-fourths of the youth in the juvenile justice system have a mental illness, according to the alliance. The numbers skew toward minorities and broken families. Mental health and substance abuse treatment spending for all ages is expected to total $280.5 billion in 2020, an increase from $171.7 billion in 2009, according to HHS' Substance Abuse and Mental Health Services Administration. Many of America's youth aren't forming the strong relationships that can help them get through tough times. That coupled with the opioids crisis and a range of socio-economic issues have created an unprecedented rise in behavioral-health issues, said Diane Osan, pediatric health practice leader at architecture firm CannonDesign. “This is shaping conversations about program development and the physical response of healthcare spaces,” she said. Beaumont Hospital Royal Oak (Mich.) recently opened a new pediatric emergency center that features 16 private rooms, which are quieter and double the size of their old formats. The three behavioral-health rooms have hidden cords, enclosed TVs and laminated pictures to protect kids from hurting themselves. Beaumont has child life specialists who work one-on-one with pediatric patients through play and other techniques to help ease anxiety. It also has animal artwork, a self-serve pantry with complimentary drinks and snacks, and point-of-care testing at the bedside. In addition to stigma, reimbursement poses another barrier, Levasseur said. “These visits aren't well-reimbursed, so they have fewer options,” she said. But hospitals are starting to provide mental health services even if payers aren't paying for them, said Mitch Levitt, business development leader for CannonDesign's pediatric practice. “We've reached a tipping point where hospitals are saying this is a significant problem that will get worse if we don't address it and figure out how to cover our costs,” he said. Providers are also allowing patients to participate in the construction and design process. Skanska, which helped design Johns Hopkins All Children's Hospital in St. Petersburg, Fla., involved patients in activities around the construction of the research and education building on its campus. Seattle Children's Hospital tested plans for new pediatric facilities by setting up cardboard mockups of the space, actively engaging patients along the way. The designers, clinical and frontline staff, and patients worked together to hone how the area would look, feel and function, using Toyota's Lean management system. Some of the frontline staff recommended moving supplies and equipment by the bedside so they could spend more time with the patient rather than rummaging through closets, said Mandy Hansen, director of facility planning, design and construction at Seattle Children's. “That leads to better outcomes,” she said. While distraction and play have typically been a big part of pediatric facility design, providers are adding physical activity that is tied to learning. Some are integrating gardens into their campuses, allowing patients to grow food that is served in the cafeteria, as well as learn about healthy nutrition habits, said Teri Oelrich, a partner at NBBJ who has a nursing background. “The idea that you could use those gardens as an educational opportunity for a family who may not have fresh produce—that can change a life,” she said. Some pediatric hospitals are setting up community parks on their campuses, rehabilitating surrounding neighborhoods, offering cooking classes and providing job training, NBBJ's Hullinger said. Dayton (Ohio) Children's Hospital opened an eight-story patient tower last year that features indoor and outdoor play spaces, a rooftop garden, designated areas for family interaction, colorful wayfinding accents and larger patient rooms. It also plays off hometown innovators the Wright brothers. The “Dragonflyer” is an interactive dragonfly sculpture that kids can move and steer as if they were gliding over the green fields of Huffman Prairie, like the Wrights did more than 100 year ago. When a 3-year-old with a recently molded cast on his right arm saw it, he threw his hands up in the air and said, “ 'Oh, wow,' ” CannonDesign's Osan said.